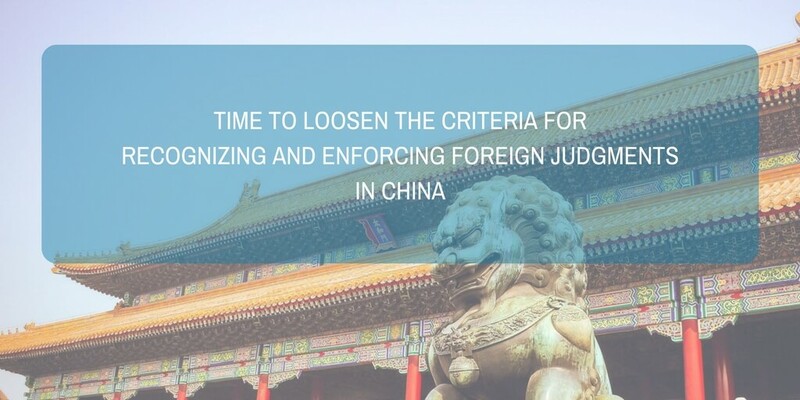 For decades, China has adopted rigorous criteria for the recognition and enforcement of civil and commercial judgments rendered by a foreign court, which resulted in a comparatively low rate in recognizing and enforcing foreign judgments. However, the situation will undergo considerable changes. 1. Special rules are being drafted to loosen the criteria for recognizing and enforcing foreign judgments. On 13 July 2017, China’s Supreme People’s Court (SPC) held an expert meeting at the Wuhan University Institute of International Law to discuss a drafted version of the “Judicial Interpretation on the Recognition and Enforcement of Foreign Civil and Commercial Judgments” (关于承认与执行外国法院民商事判决的司法解释). During the meeting, several issues lay at the heart of the debates, including the scope of application, the principle of reciprocity, refusal grounds and punitive damages, as well as the competency of a foreign jurisdiction. This is the first time for us to learn from publicly available sources that the SPC is drafting special rules on recognition and enforcement of foreign judgments. On 26 September 2017, during the Silk Road (Dunhuang) Judicial Cooperation Forum, Judge Liu Guixiang (SPC adjudication committee member, president of the First Circuit Court, Grand Justice of the second rank) indicated that China is about to actively apply the principle of reciprocity, in order to facilitate the recognition and enforcement of foreign judgments in civil and commercial matters in China. To achieve this goal, the SPC is drafting the “Provisions on Several Issues concerning the Recognition and Enforcement of Foreign Civil and Commercial Judgments” (关于承认和执行外国法院民商事判决若干问题的规定). The draft is said to identify clear standards in applying the principle of reciprocity, and to enhance transparency and facilitate the recognition and enforcement of foreign judgments. This means the SPC publicly recognizes for the first time some special rules being drafted in this area. In spite of differences in names disclosed to the public, the two documents are very likely to be the same one. Overall, it is in this SPC’s judicial interpretation that the criteria for recognizing and enforcing foreign judgments are about to loosen. 2. Rigorous criteria have long been adopted by Chinese courts in recognizing and enforcing foreign judgments. Pursuant to the PRC Civil Procedure Law and its Interpretation, five (5) main criteria for Chinese courts in reviewing requests to recognize and enforce foreign judgments are as follows. 1. The foreign judgment should be final and conclusive. 2. In case of a foreign judgment in default, the absent party should have been properly served. 3. The foreign judgment will not be recognized if a Chinese court has also rendered a judgment on the same matter. 4. Except for divorce judgments, international treaties concluded or acceded to by the PRC or the principle of reciprocity is a prerequisite for recognition and enforcement of foreign judgments. 5. The foreign judgment does not contradict primary principles of Chinese law, State sovereignty, security and social and public interest. Criterion No. 4 is a core element. By now, China has entered into bilateral treaties with only 33 countries for the mutual recognition and enforcement of court judgments. Nevertheless, as for countries having extensive trade links with China, such as the United States, Japan and the United Kingdom, such bilateral treaties have not been concluded yet. The existence of a reciprocal relationship is therefore critical for recognizing and enforcing judgments from a foreign jurisdiction. In practice, Chinese courts adopt a restrictive attitude towards the principle of reciprocity. In the SPC’s “Re the Request for Instruction on Recognizing and Enforcing a Japanese monetary judgment” (最高人民法院关于我国人民法院应否承认和执行日本国法院具有债权债务内容裁判的复函), the SPC affirmed the requested Chinese court’s decision, holding that China had not concluded or acceded to any international treaty with Japan on mutual recognition and enforcement of court judgments, nor had it established a reciprocal relationship with Japan. The enforcement of Japanese judgments was therefore refused for the lack of reciprocity. Following the SPC’s reply, this view was echoed by local courts in similar cases concerning requests to recognize and enforce foreign judgments. Thus, it can be said that in practice, Chinese courts adopt the approach of de facto reciprocity, which requires actual precedents where the foreign country has previously recognized and enforced Chinese judgments. 3. Chinese courts’ attitudinal changes correspond with China’s Belt and Road Initiative. What lies underneath the fundamental shift in Chinese courts’ attitudes towards the recognition and enforcement of foreign judgments is in alignment with China’s “Belt and Road initiative”, i.e., the “ Silk Road Economic Belt and 21st-Century Maritime Silk Road” initiative. To be more specific, Chinese courts wish to respond to the judicial concerns and demands of both Chinese and foreign market players, and to create a sound legal environment for the construction of the “Belt and Road initiative”. Pursuant to the “Vision and Actions on Jointly Building Silk Road Economic Belt and 21st-Century Maritime Silk Road” (推动共建丝绸之路经济带和21世纪海上丝绸之路的愿景与行动) enacted by the Chinese government in March 2015, this “Belt and Road initiative” aims to “promote the connectivity of Asian, European and African continents and their adjacent seas, and will enable China to further expand and deepen its opening-up, and to strengthen its mutually beneficial cooperation with countries in Asia, Europe and Africa and the rest of the world”. Accordingly, in June 2015, the SPC issued the “Several Opinions of the Supreme People's Court on Providing Judicial Services and Safeguards for the Construction of the “Belt and Road” by People's Courts” (关于人民法院为“一带一路”建设提供司法服务和保障的若干意见), which emphasizes the need to broaden the scope of international judicial assistance. In other words, for one thing, China will conclude more bilateral or multilateral treaties on judicial assistance, thus facilitating the recognition and enforcement of judgments delivered by courts from countries along the “Belt and Road”; and for another, in the absence of such treaties, based on mutual views in international judicial cooperation and/or the commitments of the requesting state to grant reciprocity, Chinese courts may grant reciprocity first, thus promoting the formation of a reciprocal relationship. 4. Chinese courts take practical steps to promote the recognition and enforcement of foreign judgments. On 8 June 2017, the “Nanning Statement” (南宁声明) was approved at the 2nd China-ASEAN Justice Forum held in Nanning. Article 7 of the Nanning Statement stipulates that Supreme Courts of participating countries will “consider facilitating the appropriate mutual recognition and enforcement of civil or commercial judgments among different jurisdictions”; “if two countries have not been bound by any international treaty on mutual recognition and enforcement of foreign civil or commercial judgments, both countries may, subject to their domestic laws, presume the existence of their reciprocal relationship, when it comes to the judicial procedure of recognizing or enforcing such judgments made by courts of the other country, provided that the courts of the other country had not refused to recognize or enforce such judgments on the ground of lack of reciprocity”. As Judge Zhang Yongjian (Director of the SPC’s 4th Civil Division) pointed out, despite the fact that China has long adopted de facto reciprocity in practice, the Nanning Statement first proposed the approach of “presumptive reciprocity” (推定互惠), i.e., to presume the existence of a reciprocal relationship in the absence of contrary evidence, marking significant progresses in this field. Furthermore, Zhang also indicated that the consensus of “presumptive reciprocity” expressed in the Article 7 of the Nanning Statement, is a concrete follow-up initiative of the “Several Opinions of the Supreme People's Court on Providing Judicial Services and Safeguards for the Construction of the “Belt and Road” by People's Courts”. The year 2017 also witnessed another progress in this field. On 12 September, China signed the “Hague Convention on Choice of Court Agreements”, an instrument for harmonizing the recognition and enforcement of foreign judgments on the international level. As Director-General of the Department of Treaty and Law of Ministry of Foreign Affairs Xu Hong put it, China signed the convention in order to facilitate resolution of civil and commercial disputes among countries along the “Belt and Road”, as well as to promote the international trade and exchange in this area. 5. Chinese recent cases show an increased likelihood of foreign judgment being recognized and enforced. On 9 December 2016, Nanjing Intermediate People’s Court rendered the ruling “(2016) Su 01 Xie Wai Ren No. 3” ((2016)苏01协外认3号), which marks a milestone development. It is the first time that a Chinese court has recognized and enforced a Singapore judgment based on the principle of reciprocity. Among others, this case was later included by the SPC as a guiding case in the “Second Group of Guiding Cases involving Construction of the “Belt and Road” (第二批涉“一带一路”建设典型案例). The guiding cases project is an SPC-led system, in which certain Chinese court judgments are selected and re-issued as de facto binding guiding cases to guide the adjudication of similar subsequent cases and ensure the uniform application of law. It is in this case that Nanjing Intermediate People’s Court ruled, “despite the absence of any bilateral treaty for mutual recognition and enforcement of judgments between P.R.C and Singapore, a Chinese court may, based on the principle of reciprocity, recognize and enforce a Singapore judgment, considering that Singapore High Court has previously enforced a Chinese judgment”. Similarly, on 30 June 2017, Wuhan Intermediate People’s Court issued the ruling “(2015) E Wu Han Zhong Min Shang Wai Chu Zi No. 00026” ((2015)鄂武汉中民商外初字第00026号), recognizing and enforcing a judgment rendered by the Los Angeles Superior Court, California, US. This is the first time that a Chinese court, based on the principle of reciprocity, has recognized and enforced a US court judgment. The case has drawn much attention in China and appeared on the SPC’s website, an indicator of the SPC’s priorities and concerns. In this case, Wuhan Intermediate People’s Court indicated that, “despite the fact that there are no bilateral treaties nor international conventions on mutual recognition and enforcement concluded between the United States and China”, “the Claimant has established that a US court has previously recognized and enforced a Chinese court decision, thus the Court confirms the existence of a reciprocal relationship between the two countries”, based on which a Chinese court may enforce a US court decision, provided that other criteria are met. 1. The SPC is about to issue special rules on the recognition and enforcement of foreign civil and commercial judgments. It is highly likely that the rules will adopt the approach of “presumptive reciprocity” proposed by the Nanning Statement. Moreover, these rules are likely to conform to the Hague Convention on Choice of Court Agreements. In other words, this will substantially increase the likelihood of foreign judgment being recognized and enforced in China. 2. Given the SPC’s current active engagement, our optimistic estimate is that these rules will be issued by the SPC, not long after this March, when the 13th National People’s Congress (NPC) finishes its personnel appointment of the SPC. 3. As soon as these SPC’s rules are issued, we will have clear criteria for recognizing and enforcing foreign judgments in China. For those who have obtained a final and conclusive foreign judgment, it is time to prepare and, where applicable, to apply for its recognition and enforcement in a Chinese court. If you need legal services for the recognition and enforcement of foreign judgments and arbitral awards in China, please contact Mr. Guodong Du (guodong.du@chinajusticeobserver.com ). Du and his team of experienced attorney will be able to assist you. For more information on Recognition and Enforcement of Foreign Judgments in China, please feel free to download our CJO newsletter vol.1 no. 1.